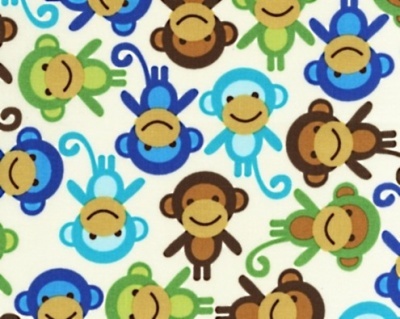 Multi Coloured monkey pattern on a white background, 100% cotton from the Robert Kaufman cotton collection. 112cm / 44" Width, this fabric weighs approximately 150gsm. Multiples of a size will be cut as one piece unless requested otherwise. Robert Kaufman Fabric company has origins that stretch back as far back as the 1920's. In 1942 a showroon on Fifth Avenue in New York was opened selling fabric and garments, before relocating to Los Angeles. Now in its third generation of family ownership, the company is one of the largest manufacturers of cotton and plush print fabric in the world. Excellent service - very quick delivery and fabric as described.